Theater Critic Michael Bourne Reviews "Downstairs" and "Thom Pain"
Theater Critic Michael Boune goes off-Broadway to review "Downstairs" and "Thom Pain"
Tim Daly and Tyne Daly star in "Downstairs"
Movie stars every season come to Broadway, but WBGO theater critic Michael Bourne this week reviews TV stars who've come OFF-Broadway. 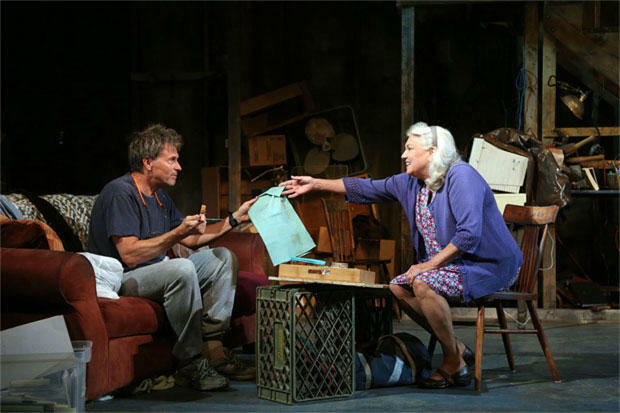 Michael gives us his thoughts on Downstairs by Theresa Rebeck and starring Tyne Daly and Tim Daly as well as Thom Pain by Will Eno and starring Michael C. Hall. Click above to hear Michael's reviews of both Off-Broadway shows. WBGO Theater Critic Michael Bourne has reviews of musicals. To listen, click the link above.